Whether we choose to call this process re-authentication or step-up authentication really depends on the access case. To meet the requirement, we’ll be breaking single sign-on (SSO) when accessing the web application above by sending parameterised requests from the web application to AD FS, specifying how to handle authentication uniquely for this app. Some folks may have pre-conceived ideas about what constitutes step-up, perhaps because it is often associated with multi-factor authentication. While the two do complement one another nicely, step-up is not necessarily multi-factor. Rather, use of step-up as an access mechanism, is governed by the strength of authentication we wish to accrue to access, at a level commensurate with requirements for protecting that resource. We can use weaker (single factor) authentication where this is deemed sufficient or appropriate. As an example, a customer may employ two-factor authentication on the outside/edge for all users and then elect to use the AD password, as an additional step-up mechanism for corporate users only to gain access to internal resources. In authentication strength terms, this is step-down authentication, but in functional terms, it’s designed as a step-up method. I make the above point, because in the examples described here, we have users logging onto their workstations either using weak (username/password) or strong (two-factor) authenticating against other federated web applications with these credentials. In each case, we plan on forcing users to logon again when they access this particular SAML 2.0 web application to “step-up” security. Accordingly, we’ll create a deny Issuance Authorization Rule on our SAML web application so that users connecting through the proxy will be blocked. 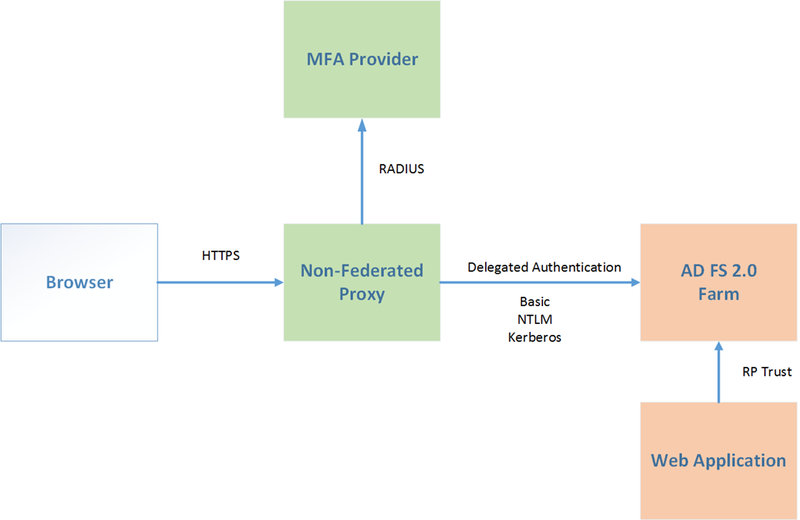 In a default AD FS farm setup, a domain-joined Windows machine internal user connects to the AD FS farm and authenticates via the Integrated Windows Authentication (IWA) handler using Kerberos/NTLM. To alter this behaviour, for a given application, and force the user to re-authenticate, we must ignore the existing session cookie. For a relying party using the WS-Federation Passive Requester Profile (WS-PRP) we can also specify the request in the query string or within application code also via wauth. Use of a Comparison rule that is set to exact to expressly set the authentication method. Other settings are also possible (which AD FS supports) but are not covered in this post. Let’s look at the farm-connected conventions mentioned above in a bit more detail. In Windows SSO logon scenarios, the AD FS integrated handler uses the SAML AuthnContextClassRef of urn:federation:authentication:windows. 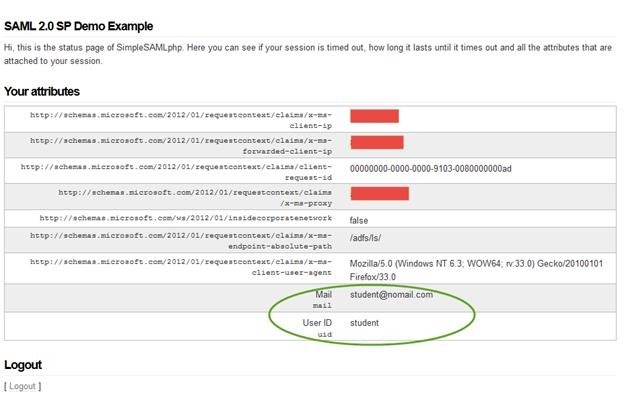 On our SAML 2.0 web application, we’ll request a authentication context class reference of urn:oasis:names:tc:SAML:2.0:ac:classes:Password, so that the forms handler (in AD FS) is targeted as the desired authentication handler. The specification of ForceAuthn=true in the initial SAML request from the service provider specifies that the Identity Provider (IdP) should force re-authentication of the user, even if they possess a valid session with AD FS. The SAML 2.0 protocol supports the use of a comparison rule to determine the level of precision to be accorded to the authentication request. If none is specified, AD FS will assume that the attribute is set to exact, meaning that authentication should conform exactly to the AuthnContextClassRef request and is passed to the appropriate handler. 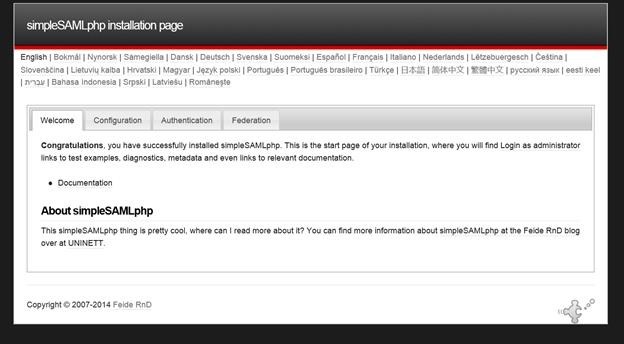 Using OpenAM as a SAML SP example, we’ll invoke SP-initiated sign-on through the spSSOInit.jsp page. In the query string we’re specifying the authentication context and the desired force authentication. Note: The above syntax is valid but watch out for white spaces in the example above, not to mention your own domain name. I’ve added spaces to make the text more legible. AD FS will parse the request based on the emboldened items in the query string and ask the user to re-authenticate via forms sign-in. 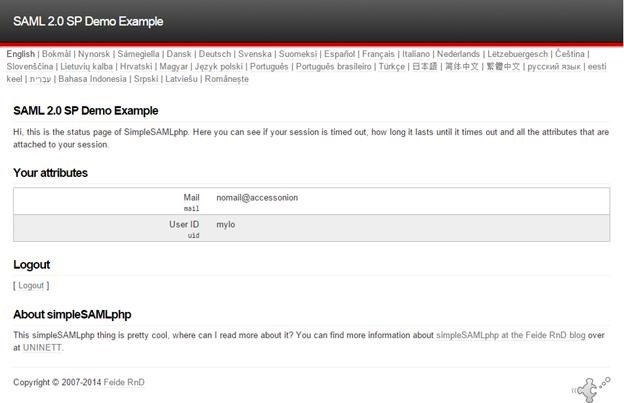 In SimpleSAMLphp, we can set the necessary settings in the configuration file authsources.php, specifying the authentication context and force authentication requirement. The simplest option sees the the user replaying their AD credentials, logging on again via the AD FS form, before gaining access to the web application. This is clearly not step-up and doesn’t afford any significant additional protection, , but may fulfil compliance/auditing requirements for access. Security gain is nominal. Requires claims authorization rules on the relying party to differentiate between valid/invalid users. Option 2 uses another set of credentials held within the same AD FS forest. Access to the SaaS application is limited to those users using these credentials (i.e. their “step-up” identity) and an authorization rule to supplement this. 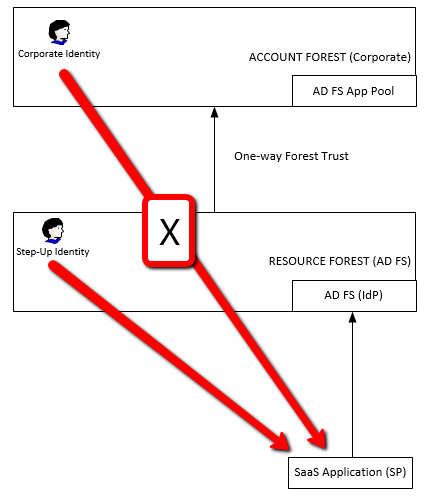 In the above setup we have an account forest for our corporate users and a resource forest, where the AD FS server lives (with the AD FS application pool account running in the account forest). A one way forest trust between the two exists. In this option, the step-up identities reside in the resource forest. For Options 2 and 3, we can also provide further refinement by using AD fine-grained password policies to implement a stronger password policy / account lockout policy applicable to our web application, that exceeds the ordinary password policy levels used for for corporate AD users. In all above cases, we should consider further restraining access by passing custom claims on the relying party, to assist in determining whether the user in question should have access. Firstly, there a nice solution posted on CodePlex, that works similar to the actions described in this post, albeit by customizing the AD FS sign-in pages instead. It allows assigning the use of forms logon logic to relying parties and also covers IdP-Initiated Sign-On and WS-Federation. Relying parties registered to use the forms logon are registered in AD FS web.config file, thereby bound to the forms handler. Also, some customers may be unwilling to modify their default AD FS setup because of a fear that it will throw them outside the realms of Microsoft support. However, if you do wish to support IdP-Initiated sign-on scenarios using the methods above (AuthnContextClassRef and ForceAuthn), then I’m afraid you don’t have much choice as customization of the code-behind page for idpinitiatedsignon.aspx.cs is required. Without these changes, sign-on, either via logintoRP or relaystate query parameters, will fail as the desired authentication context (AuthnContextClassRef) has not been set and is not passed by the IdP to the service provider. I used the following MSDN article as a reference to customize the idpinitiatedsignon.aspx.cs and then tested this using logintoRP parameter, with the query string example below. In Part II, we’ll look at step-up options with stronger / multi-factor authentication methods (aka Option 4). See ya! 1. The PostReleaseSchemaChanges.ps1 script applies only to AD FS Windows Internal Database (WID) configurations. The script is provided with the RU3 update under the SQL sub-folder. Ýet another riveting title Dispensing with WS-Federation, we’ll move onto looking at SAML 2.0 integration with AD FS, in particular IdP-Initiated sign-on. 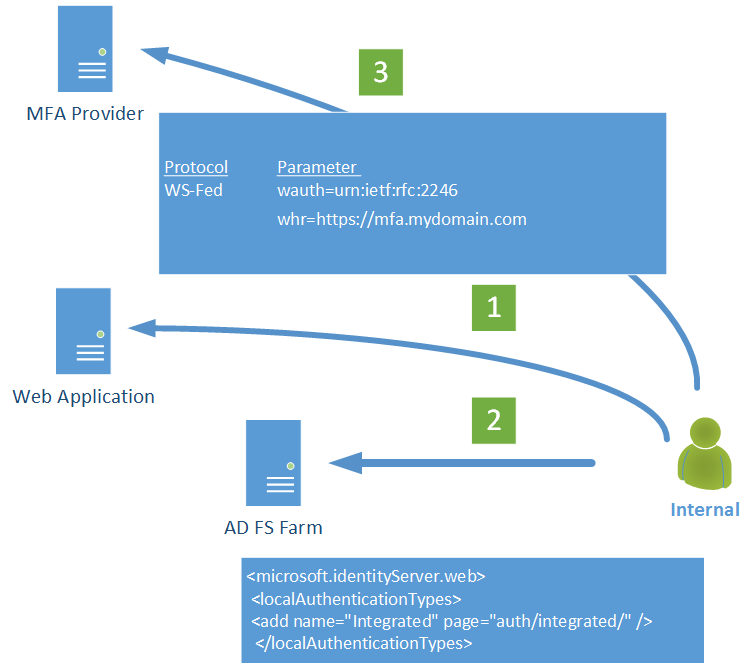 In the last few posts we’ve looked at how AD FS 2.0 admins can manipulate the use of the whr function to assist in the realm discovery process as part of sign-in to AD FS using WS-Federation. With AD FS 2.0 and SAML 2.0, a long-awaited feature has been support for SAML 2.0 RelayState. With Rollup 2, the AD FS team have come up with the goods. 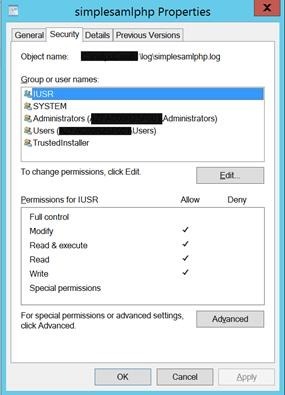 Like whr on the WS-Federation side, the use of RelayState allows us to support IdP-Initiated login from a SAML 2.0 identity provider (IdP). Before we look at some examples, here’s a few useful tools to aid building and debugging the use of RelayState. To get started, there’s a nice article on the Directory Services blog at Microsoft, as a backgrounder to understanding what’s going on via Rollup 2 and RelayState. 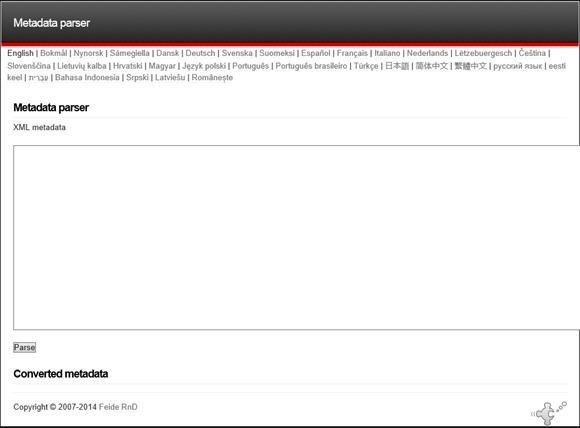 http://blogs.technet.com/b/askds/archive/2012/09/27/ad-fs-2-0-relaystate.aspx. 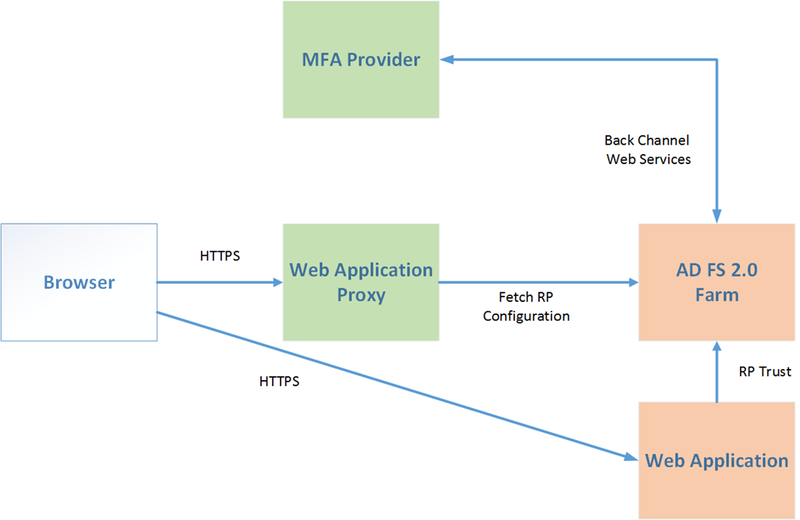 In the above example, our user needs to connect, via the Internet, to a remote web application that is configured as a SAML 2.0 Service Provider. This service provider is engaged in a federation trust with AD FS. AD FS as a Relying Party Security Token Service (RP-STS) has the SAML 2.0 Identity Provider (IdP), in the home realm of the user, configured as a claims provider (CP). In the above scenario, both the service provider (SP) and the identity provider (IdP) are remote to the organization. This could be a cloud / SaaS application that the RP-STS organization provides access to to both its users and the remote identity provider organization. In the above example, the Identity Provider (IdP) and AD FS are part of the same organization. The IdP could be an Access Management platform such as OpenAM, a remote access gateway such as a Juniper SA, or an Extranet ADFS instance with the AD FS RP-STS acting as a broker. 1. Install AD FS 2.0 Rollup 2 on all instances where AD FS is involved: proxies, farm members and also third-party organizations if AD FS is installed there. 2. 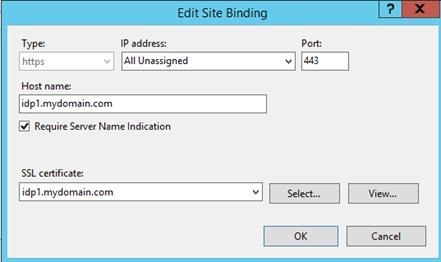 Add the following change to <microsoft.identityServer.web> section of the IIS web.config of all participating AD FS instances, under the /adfs/ls path. In this example we’ll evaluate ADFS in a SAML 2.0 Identity Provider (IdP) role within a third party Organization, called Fie, and also as a Relying Party Security Token Service (RP-STS) within the resource organization (Foo). Fie Users may click on a hyperlink or a bookmark that kicks off the logon process with their IdP, and through the use of RelayState, via the parameterized Relying Party Identifiers provided to the IdP and RP-STS ADFS instances, the user is sent to the service provider application. For our web application and SAML 2.0 SP, I’m going to use cloud provider OneLogin. This will act as an application portal. Once logged on via the IdP, the user is sent to the OneLogin portal thru the RP-STS of Foo. Referring to the diagrams above, this access scenario probably best fits Figure 2. Since the web application belongs to Foo, we’re using an indirect trust involving the Foo ADFS instance as an RP-STS. 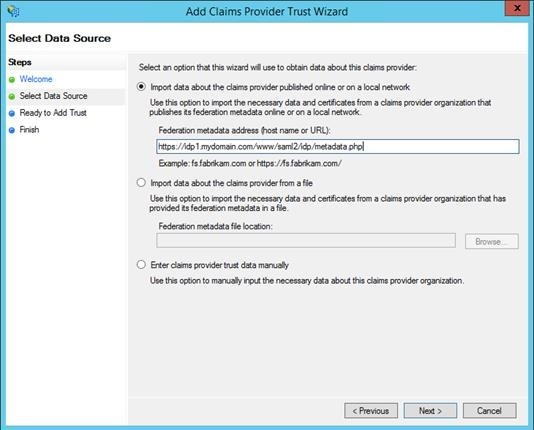 Fie is a claims provider (CP) to the Foo organization ADFS and the web application is a SAML 2.0 Service Provider (SP) that trusts the ADFS instance as an Identity Provider (IdP). Here are the service endpoints and relying party identifiers that we need to use to build the appropriate link. 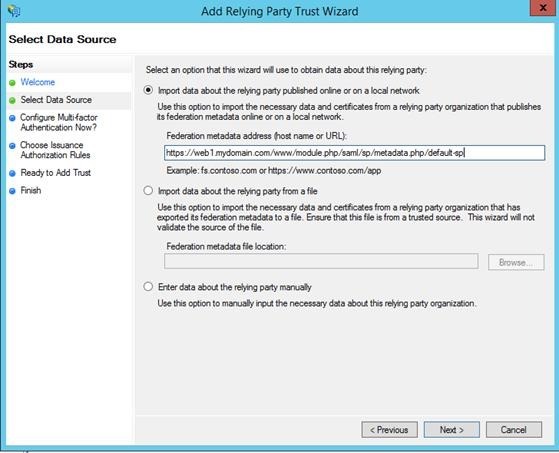 Using the new notation provided in Rollup 2, two relying party identifiers (RPID) are required in order for the relay to the web application to work correctly. The RPID in ADFS terms is the identifier. For a SAML 2.0 SP, this is the Entity ID of the web application. In some scenarios the entity ID may not be sufficient and additional parameters required. Refer to the Microsoft article mentioned earlier on how this may be further encapsulated into the RelayState. I’ve included the URL encoded and decoded syntax below to give you an idea the syntax we’re forming. Part 1 is the URL of the Identity Provider, Part 2 the query string and RelayState for the RP-STS, and Part 3 state for the SAML 2.0 SP. I began the post with a smiley, so I’ll end with one.. nice feature .. 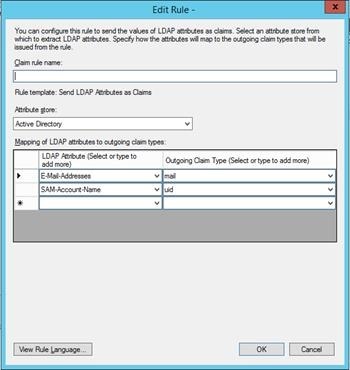 Under ADFS 2.0, Microsoft support the SAML 2.0 IdP Lite and SP Lite modes described in the Liberty Alliance/Kanatara Initiative interop program and eGov Profile 1.5, covering the essentials for identity federation. From a configuration perspective, we often come across issues in the federation setup phase that can trip up ADFS and the administrator. Sometimes this is the case when dealing with SaaS applications, where there may be minimal customization possible from the vendor standpoint, with the application living in a multi-tenant environment. Tweaking “their side” may not be possible or something that the vendor is comfortable or capable of doing. 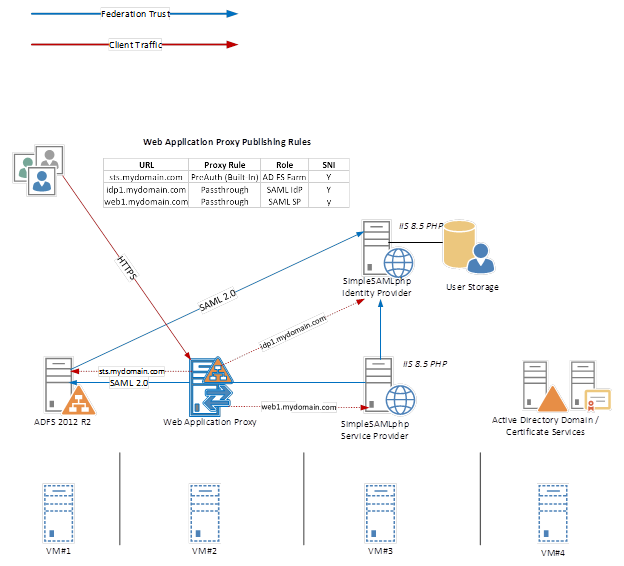 In this post, we’ll look at some of the integration issues one may experience when integrating ADFS as an IdP with SAML 2.0 SP web applications using the SAML 2.0 POST profile. There are a number of useful debugging aids/tools that can assist in the troubleshooting process. All of the above are useful to lean on and gather problem-solving information during troubleshooting. 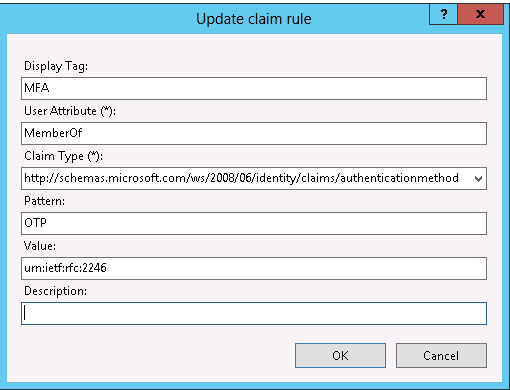 Scenarios covered here are using ADFS 2.0 as an Identity Provider (IdP). There are some common gotchas when configuring the relying party in ADFS in the UI. 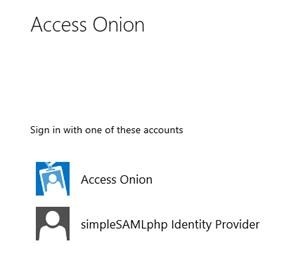 Based on the SAML specs, the <samlp:AuthnRequest> must include a <saml:Issuer> including the EntityID of the Service Provider. If you’re creating the relying party manually, double check that the relying party identifier you specify matches that of the EntityID specified in the XML file provided by the Service Provider. 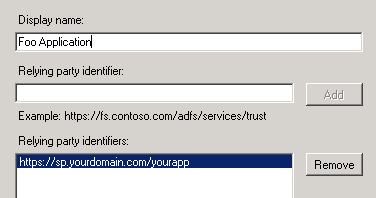 Microsoft.IdentityServer.Service.Policy.PolicyServer.Engine.ScopeNotFoundPolicyRequestException: MSIS3020: The relying party trust with identifier ‘https://sp.mydomain.com/foo’ could not be located. 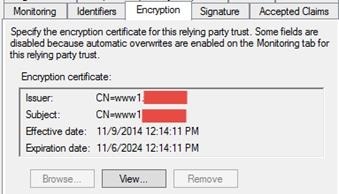 Another problem to be wary of is certificate revocation checking… if a Certifcate Distribution Point (CDP) is referenced in the signing or encryption certificate of one of the federation partners, then the corresponding party must be able to reach that CDP in order to determine the validity of the certificate. This can be problematic, for example, if your security policy blocks connections from servers to the Internet or if the counterpart does not publish it over the Internet. Flip the secure hash algorithm over to SHA-1 on the Advanced tab in the Relying Party trust to fix this. 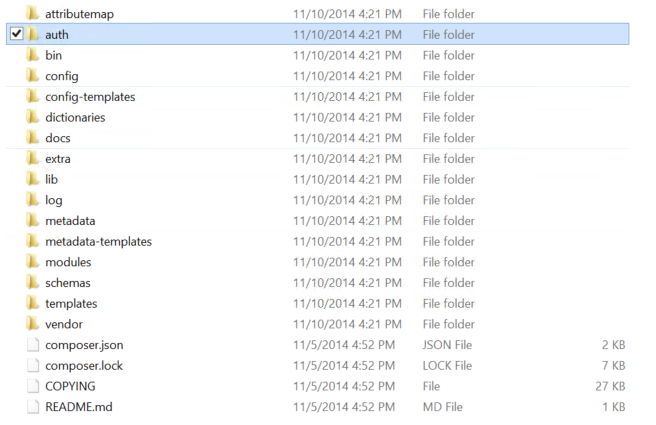 Contained within are some SAML integration issues experienced that I wanted to share. Normally contained with an authentication request is the NameID Policy and format attribute(s). There are numerous ways in which intended or unintended settings can trip up the federation process. When troubleshooting, start with the ADFS event logs as these can be quite revealing. Here are a couple of sample problem cases. PROBLEM: A federation trust has been setup between Organization A and SaaS Provider B. 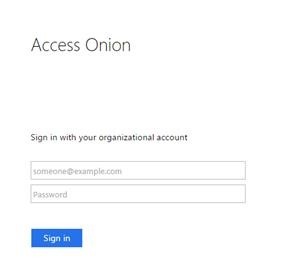 Users attempt to access their SaaS application via SP-initiated logon. 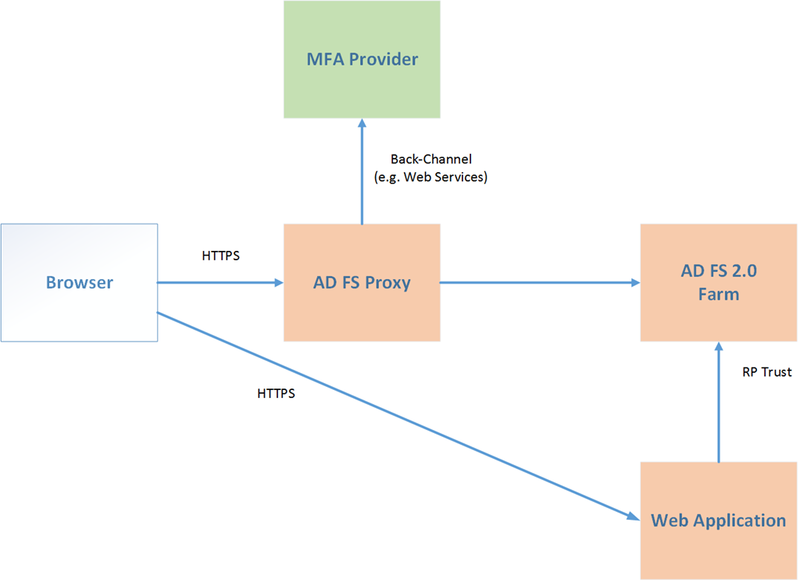 After logging on an at ADFS, the SAML redirect returns them to the web application where it fails with a generic HTTP 500 error at the web application. MSIS1000: The SAML request contained a NameIDPolicy that was not satisfied by the issued token. Requested NameIDPolicy: AllowCreate: True Format: urn:oasis:names:tc:SAML:2.0:nameid-format:transient SPNameQualifier: . Actual NameID properties: Format: urn:oasis:names:tc:SAML:1.1:nameid-format:unspecified, NameQualifier: SPNameQualifier: , SPProvidedId: . SOLUTION: The Event Log message also reported that “Use the AD FS 2.0 Management snap-in to configure the configuration that emits the required name identifier.” In other words, fix the identifier… our mismatched name identifier in this case can be fixed by creating a transform Rule and setting the NameID format to what the relying party expects - transient. In the example below, we take the incoming claim of Common Name and pass it to the Name Identifier in Transient form. In my case, the application I was using involved personalization and rendered this approach unsuitable. Also, by transforming Common Name into Transient on the claims pipeline, we are also circumventing the privacy-preserving methods that Persistent/Transient were intended for, as the name is no longer obfuscated. Token encryption can be used to overcome this, but that brings its own caveats. PROBLEM: A federation trust has been setup between Organization A and SaaS Provider B. 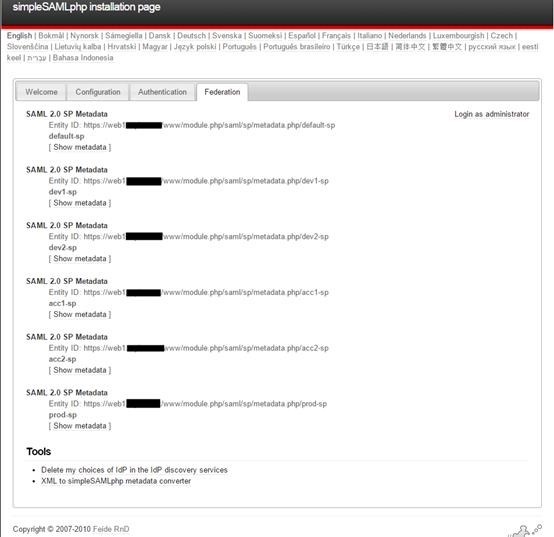 Users are attempting to access the SaaS application via an SP-initiated logon process. 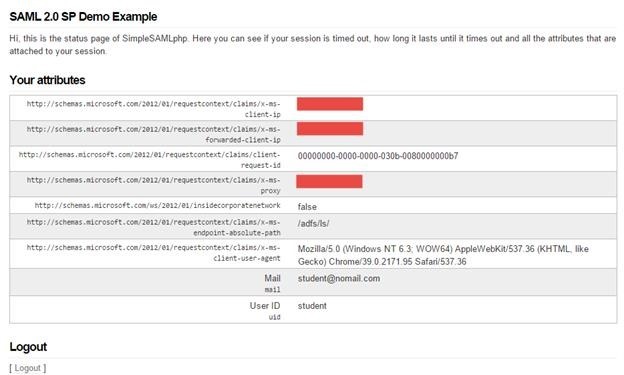 After logging on an at ADFS, the SAML redirect sends them to the web application where it fails with a generic HTTP 500 error at the web application. MSIS1000: The SAML request contained a NameIDPolicy that was not satisfied by the issued token. 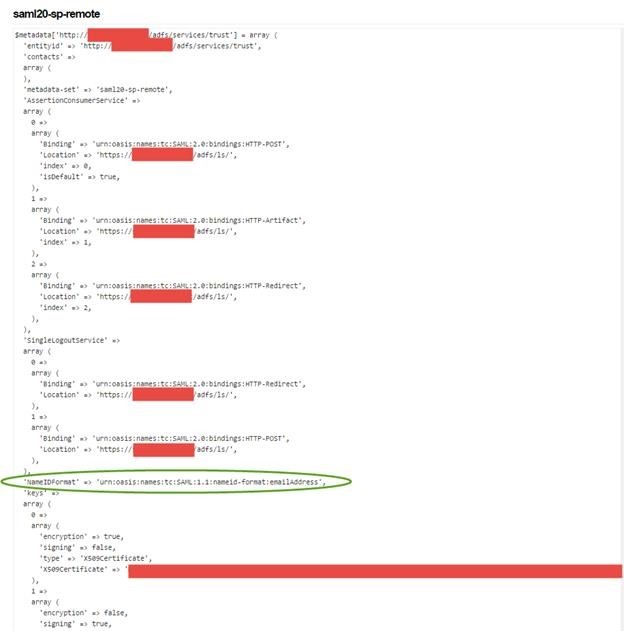 Requested NameIDPolicy: AllowCreate: True Format: urn:oasis:names:tc:SAML:2.0:nameid-format:transient SPNameQualifier: https://sp.yourdomain.com/yourapp. Actual NameID properties: Format: urn:oasis:names:tc:SAML:2.0:nameid-format:transient, NameQualifier: SPNameQualifier: , SPProvidedId: . Looking at the ADFS logs we see MSIS1000 errors. 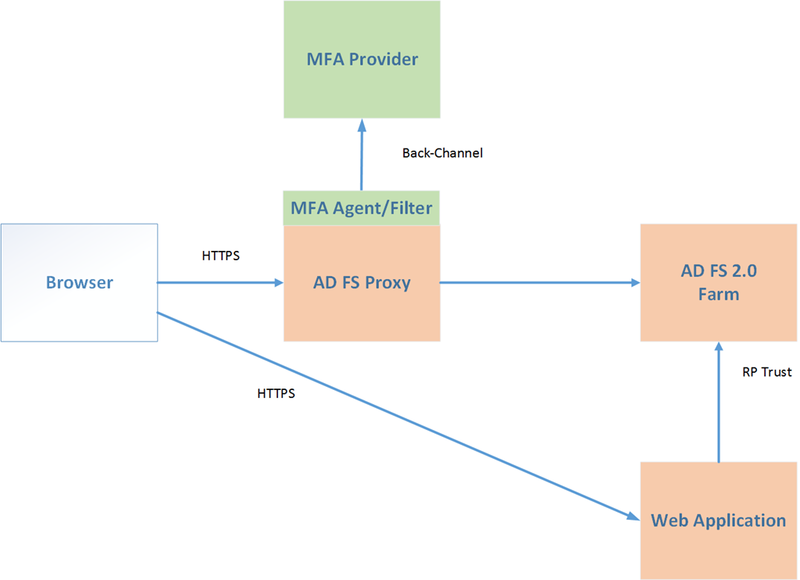 In this scenario, ADFS is not providing an expected NameQualifier and SPNameQualifier to the Service Provider in the SAML Response. 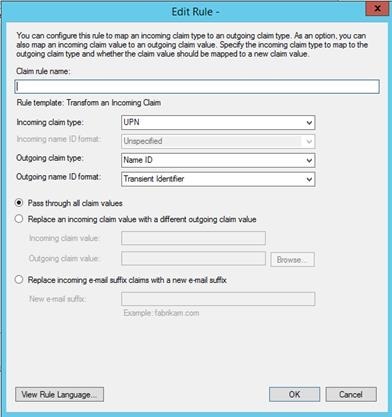 Via a claims rule we can insert the relevant information that the service provider is seeking to satisfy the authentication request. PROBLEM : A federation trust has been setup between Organization A and SaaS Provider B. Users are able to logon to the SaaS application via the ADFS Proxy from home or remotely using form-based logon. When they logon internally, via the ADFS farm, the same users are not able to do so and get an HTTP error. In the above SAML authentication request, the Service Provider (SP) is specifying that the expected authentication context from ADFS is urn:oasis:names:tc:SAML:2.0:ac:classes:PasswordProtectedTransport. Users doing an integrated windows logon are not emitting this authentication context and instead they transmit urn:federation:authentication:windows in the authentication context to the RP and it may trigger an exception. (a) the service provider may be able to submit the additional authentication context for Windows authentication (urn:federation:authentication:windows) to their configuration. 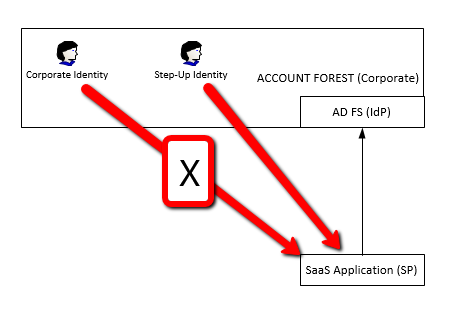 PROBLEM: A federation trust has been setup between Organization A and SaaS Provider B. Domain-joined users expecting single sign-on through ADFS are being presented with the forms logon handler when accessing the SaaS application internally. They then have to manually enter their credentials per session. The service provider was, by specifying a comparison of "exact", forcing the authentication context for all users to be set to PasswordProtectedTransport, inadvertently telling ADFS to downgrade authentication for domain-joined clients to forms logon, thus defeating/breaking SSO for internal clients. 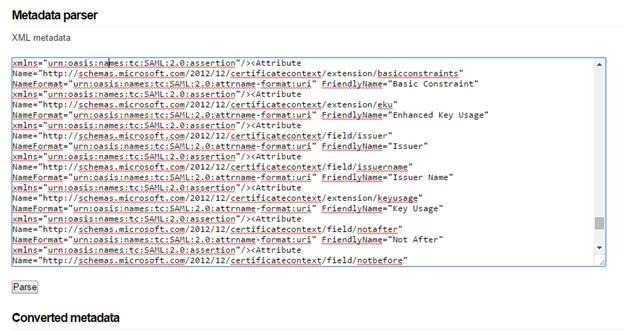 SOLUTION: Ensure that the SP sets the RequestedAuthnContext comparison to minimum. That’s it for the moment…… I’ll add to this when new scenarios crop up or via input from other contributors..